This certification (along with CPR/AED) meets the American Camp Association new 2019 Standard ST.3.1 and ST.3.2. ​Dates: February 23 (Saturday 8:30am) through February 24 (Sunday 5:00pm), 2019. Place: Camp Bethel, 328 Bethel Road, Fincastle, VA 24090. Cost: $198/person for WFA only (includes Sat lunch & dinner & Sun lunch). Optional: February 22 (Friday 7:00pm-10:00pm) Adult/Child CPR w/ AED training; $48/person. Registration Deadline for both courses is February 14, 2019! $198 WFA registration includes Saturday lunch & dinner, and Sunday lunch. Indicate dietary restriction in your Registration Form. ​LODGING at above rates is in heated bunkrooms, shared with up to 4 others (same gender) with a bathhouse next door. Cottages (including kitchen and bathroom) are available to rent to individuals and groups by separate reservation contract. Local hotels are within 8 miles of Camp Bethel. Cancellation Policy: $128 of your WFA fee is NON-refundable. For cancellation before February 14, we are only able to issue a $70 refund because we have already paid SOLO for your reserved spot. Cancellation AFTER February 14 is 100% non-refundable. Only if SOLO chooses to cancel this training would we provide a full refund. QUESTIONS: Contact Barry LeNoir at CampBethelOffice@gmail.com or 540-992-2940. 1. Pay for your course or courses below through our secure "What course?... pull down menu" PayPal button using any major credit card or a PayPal account. You must pay the course fee(s) in full in order to register on-line. There are no additional fees or surcharges for on-line payment, and you will be able to review your fee prior to payment. WFA Course fee includes Saturday lunch & dinner and Sunday lunch. 3. Submit Data: After successfully paying, PayPal will direct your browser to our secure Registration Form (it's a Google Form). Allow at least 10 minutes to complete, and be as thorough as possible before you SUBMIT the form. If your browser does NOT redirect you to the registration form, scroll to the link below the payment buttons to complete YOUR REGISTRATION. 4. 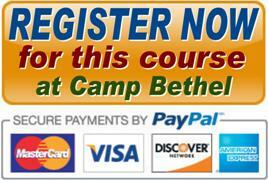 Get your Confirmation E-mail: After submitting your Registration Form, Camp Bethel will contact you via e-mail. Add "CampBethelOffice@gmail.com" to your contacts so that we can send you an e-mail with weekend information, a required Health Form, and important information about your course. ​If you already paid, but your browser didn't direct you to our on-line registration, be sure to complete the registration and submit your data HERE.